Worthington Photography will close on August 31, 2017. Thank you, Castro Valley, for letting me grow up with you and capture your life memories. I started as a kid working in Mom and Dad's studios. It became a life-long career mostly at the studio next door to the Ice Creamery on Castro Valley Boulevard. I have photographed you as high school seniors, your bridal portraits, babies, children, their graduations, and currently your grandchildren. But now I intend to retire the studio to move on to new pursuits. I will be available to complete any unfinished work with clients until closing on August 31st. Thank you for your loyal support over the years. My dad, Lawrence J. Worthington, was a teacher in Castro Valley before his photography hobby turned profession. Dad taught fifth grade at Stanton School in the 1960s. In 1976, he opened his first studio on Redwood Road (by Trader Joe's), while teaching English as a Second Language at Laney College in Oakland. Mom, Carol Worthington, resigned her ESL teaching position to run the photography business. Dad claimed that it was only because his first wedding photography assignment was at the scenic Mills College that his photography career grew. One wedding led to another and he joined professional photography societies and community organizations. He sponsored Castro Valley baseball teams, networked with wedding businesses, and displayed his work around the Bay Area. 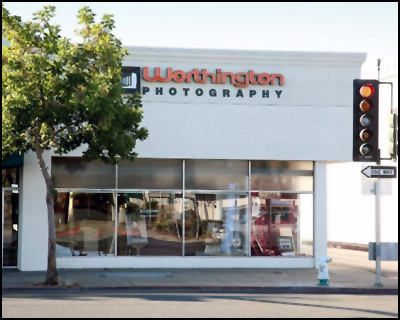 Worthington Photography quickly outgrew that first studio and moved to a bigger store front, located where the Castro Valley BART Station is now. 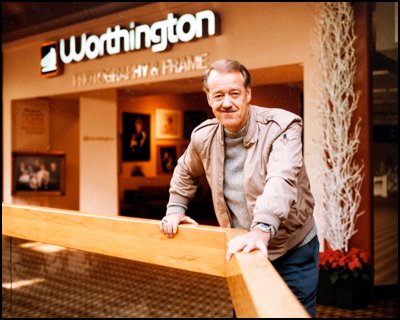 It was during this time, in the early 1980s that dad opened a second studio in San Leandro at Bayfair Mall. We were a family business by this time in many ways. I began my photography career as a college student, working evenings at the Bayfair studio. My brother, Wade Worthington, shot portraits at the Castro Valley studio, which had moved onto Castro Valley Blvd. next to the Ice Creamery. We employed many wonderful photographers and staff, whom we still consider to be like family today. In the early 1990s, the Bayfair studio moved with Wade to the Humboldt area, where he operated Worthington Photography studios in Arcata and then in Eureka. We lost Dad to heart disease in 1996, and Wade returned to the Bay Area shortly after the birth of my youngest child. As parents of small children, Wade and I both developed relationships with faithful clients as our children grew up together in Castro Valley sports and schools. We designed sets for children's specials that became tradition for many parents. For decades, we looked forward to the time of year when we photographed Castro Valley Parent Nursery School, San Leandro School of Dance, and Redwood Christian High School seniors. Mom retired in 2007, and Wade moved to Portland. I inherited an expanded Castro Valley Studio, which I will always consider the best storefront location in Castro Valley -- in the busy Santa Maria intersection and right next door to Knudsen's Ice Creamery. Together, we held monthly drawings to photograph and display the Knudsen's Ice Creamery Kid of the Month. In 2010, I downsized and moved the studio to my home while operating a satellite business office downtown at David Wilhite's Intero Real Estate office. I began sharing my love of photography with teen students, taking them on weekly photo hikes in the local hills and parks. This introduction to teaching led to the start of Castro Valley Photo Club and the past two years of teaching photography classes at Castro Valley Adult and Career Education. Thank you, Castro Valley and loyal clients, for being part of my family history, memories, and supporting Worthington Photography all these years.